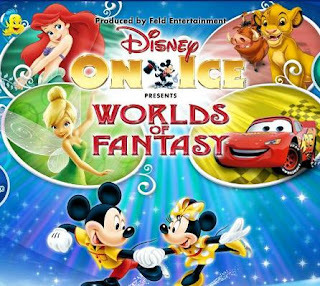 25th October 2011 - Having never been to an ice show before, I wondered what it was all about, but being a fan of all things Disney, it was something that I just had to go and see! Following a trail of children dressed as their favourite Disney characters along with their flashing wands, tiaras and slushy cups, we took our seats around the rectangular ice rink. 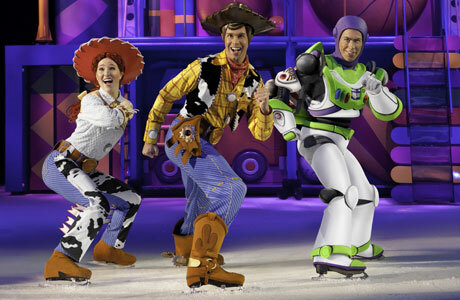 The show began with Mickey & Minnie Mouse, Donald Duck and Goofy, with all their usual mannerisms and voices but with added ice-skates. Goofy’s clumsiness is particularly to be admired with the way he stumbles and slides across the ice. When Mickey’s car breaks down, Mater the tow-truck and other vehicles from Disney’s ‘Cars’ take to the ice. The cars themselves are smaller and very realistic replicas of well-known models, including a Porsche, Cadillac and Lightning McQueen the Ferrari. They drive across the ice with well-planned choreography, supported by moving spotlights, music and narrative. Next up is the underwater world of King Trident’s Kingdom and excerpts from Disney’s ‘The Little Mermaid’. A swarm of skaters with flowing fabric make a great representation of the rolling waves and a flock of colourfully costumed sea-creatures give a carnival feel to ‘Under The Sea’. Ariel dances lyrically across the ice with technical promise in her solo numbers and herself and prince Eric perform a romantic duet containing lifts and some daring partner work. Eric himself is a very strong skater and performs a number of jumps with ease and skill. Ursula really does look like she has been picked out from the original movie with her long black tentacles whilst the eels ‘Flotsom & Jetsom’ are made complete, each with their single glowing eye. I found Tinkerbell and the Fairies part of the show, less visually thrilling but not knowing this Disney story as well as the others, I was trying to focus on what was happening. Tinkerbell and the fairy queen flew gracefully through the air at times during the performance whilst the other fairies performed their magic on the ground. The finale of this section was much more exciting with inflatable flowers lining the rink, butterflies dancing high above the space and lots of fairy dust! After a short interval, it was time for a reduced version of Toy Story 3. The costume designers and makers for this production must be applauded as the characters were made to look exactly as they are in the film, down to every last detail. 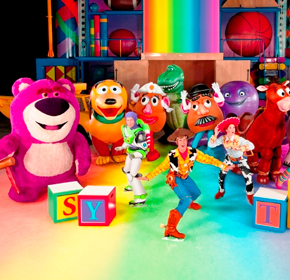 Barbie even had stiletto ice-skates and two skaters worked together to become the front and back of Slinky Dog! All the gang were present, skating as well as they could in their somewhat restrictive costumes. A highlight of this section was the opening number of ‘green plastic’ toy soldiers skating in formation, including one parachuting down from the ceiling. All in all, ‘Disney on Ice’ is a great family day out that will appeal to all ages. Just don’t forget to pack your fairy wings!